A perfect white smile with veneers. A radiant smile is considered an expression of health and vitality – it has a positive effect on the self-confidence. People with beautiful teeth like to smile and do so more often. On the other hand, unattractive, stained or crooked teeth are considered unpleasant; this can lead to inhibitions and reduce the quality of life. Optical flaws can be simply concealed with veneers. 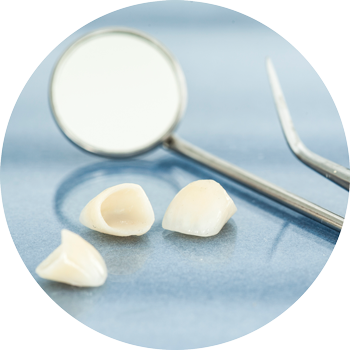 Veneers are wafer-thin ceramic or acrylic covers, which form a permanent layer over the tooth. Veneers are used predominantly for aesthetic optimisation of the teeth. To create them, an impression is taken of each individual tooth. This guarantees the veneer fits perfectly, so that it can be integrated inconspicuously into the patient’s row of teeth and give a flawless smile. So that the veneers hold reliably, the front teeth to be treated are initially cleaned thoroughly and the surface of the teeth minimally ground, which contributes to a strong and reliable hold. This ensures that at the end the teeth which are to receive veneers have the same thickness and height as the surrounding teeth without veneers. The next step is to create an impression. The patient will be provided with a temporary veneer until the final veneer is attached. After the ceramic veneers have been created in the dental laboratory, these are attached to the teeth in place of the temporary veneers using a special tooth-friendly adhesive; this takes approximately 30 minutes per tooth. In addition to the method described above, in some cases there is the possibility of using very thin veneers, which are around 0.2 mm thick. The so-called “non-prep” veneers are attached directly to the tooth, without it being previously ground. The advantage this technique is the possibility of also attaching veneers to acrylic fillings, ceramic crowns or bridges. The dentist decides which of the two techniques is appropriate for which patient on an individual basis.